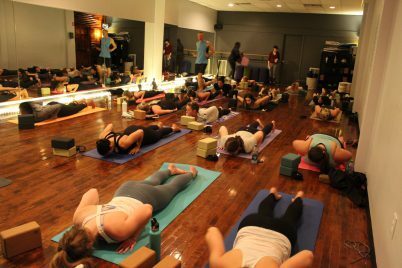 Threads Fashion Week provides donation-based Yoga class | Grand Central Magazine | Your Campus. Your Story. In preparation for the Threads Fashion Show on Saturday at Central Michigan University, the class dedicated to organizing Threads planned an event-filled week. 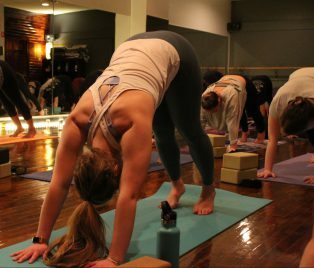 One event they held this week was Threads Yoga, which was held at Yoga on Main in Downtown Mount Pleasant. CMU senior Megan Vanderkuur is the Event Management Director for Threads. “Fashion Week is all about bringing attention to the show through different promotional events around campus and educating those who might not know about Threads,” Vanderkuur said. Vanderkuur is in charge of coming up with event ideas, booking the venues, promoting and executing the events before the day of the show. 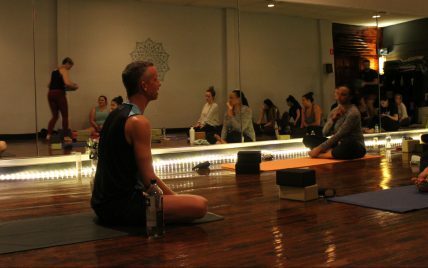 Ian Mull instructed the donation-based yoga class at the Yoga on Main Studio. Mull is also a professor for fashion merchandising and design at CMU. Senior Jenna Boulter is the Public Relations Director for Threads. “It was a really nice time to relax and take my mind off my busy life and prepare for some busy days leading up to Threads Fashion Show,” Boulter said. Owner of Yoga on Main, Alison Miller, bought the yoga studio about six months ago. Miller has been doing yoga for more than 20 years and she’s also a health coach. “I love that people are gaining better health by doing yoga and being part of this community,” Miller said. Yoga on Main offers over 20 classes a week, including hot yoga, slow flow classes and vinyasa classes. The studio will be offering a boot camp that starts May 7th that will incorporate PiYo and P90X. After a week filled with events for Fashion Week, Threads will be held on April 6 at 7 p.m at the Biosciences building on CMU’s campus. Separator image Posted in Beauty, Men's Style, Style & Beauty, Women's Style and tagged with beauty, Fashion, fashionweek, Janna Salimovic, Style, Threads, threads2019, yoga.